Mobile electric bulk materials handling machinery found across a wide spectrum of sectors, from open cast and underground mines to quarries, stockyards and ports, require energy, data, air and/or fluids to operate. Extended uptime and high productivity levels, a consequence of equipment reliability and longevity, are fundamental to sustainable production and subsequently the profitability of these large operations. Consequently, it is paramount that festoon systems, the life blood of these machines, operate seamlessly, even under the harshest conditions. 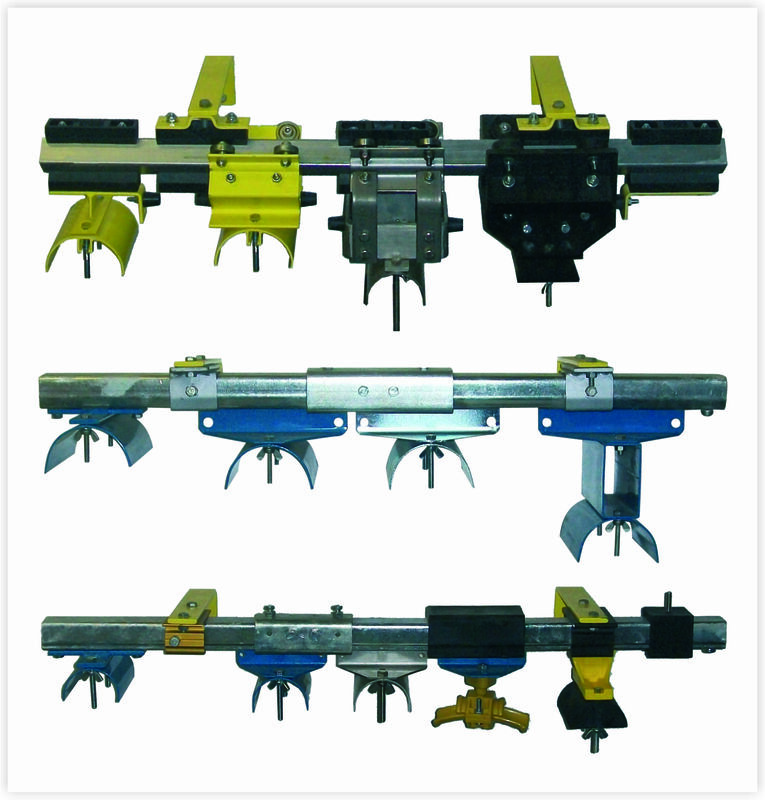 Diamond track system (top) heavy duty C rail system (middle) & light to medium duty C rail system from Powermite. “Incorporating state-of-the-art, world-class technology, our specialised Conductix festoon systems are next level when it comes to quality, reliability and efficiency,” notes Rolf Lung, Managing Director of Powermite, a specialist supplier of electrical and mechanical equipment for moving machinery to local industry for close on 50 years. Powermite and Conductix-Wampfler’s combined experience of over a century in electrification systems is reflected in the modular design of the light, medium and heavy duty festoon systems which maintain a reliable, efficient, uninterrupted feed of energy, data, air and fluids to mobile electric bulk materials handling machinery. The Powermite/Conductix festooning range presents an extensive array of configurations for straight runs, bends and circular configurations, making these feeding systems ideally suited for virtually any type of moving equipment including bulk material conveyors, stackers, reclaimers, travelling hoppers, rail car dumpers, plating lines, water treatment and car wash systems. The performance of energy and data transmission is significantly influenced by the design and correct alignment of the cable. The compact, rugged and reliable custom-made Powermite/Conductix-Wampfler I-Beam and C-Rail cable carriers on the festoon systems effectively and efficiently handle and protect flat and round power/data cables. With a load capacity of up to 125kg and maximum system length of 150m, the I-Beam cable carrier is suited for heavy duty applications including bulk container handling by cranes typically found at ports. The C-Rail cable carrier, available in zinc-coated and stainless steel, is an ideal energy supply system for light to medium duty applications and is suitable for indoor and outdoor use. A special fully imported version for explosion-proof areas is also available from Powermite. “Our offering also includes festoons that run on diamond track or square rail which has been specially engineered to prevent dirt build-up and reduce dust accumulation,” adds Lung. Irrespective of the particular cable or hose package, the running speed or the location of the machine, Powermite/Conductix-Wampfler has the appropriate ISO 9001:2008 certified festooning solution for diverse industries such as mines, steel mills, ports, power plants, airports, warehouses and automotive facilities. “Above-average operational life, easy installation, uncomplicated operation and cost effective maintenance with subsequent lowest total overall operational and ownership costs are some of the key benefits our Conductix festoon system solutions offer to customers and end-users,” concludes Lung. Powermite, a Hudaco Group company, supports a complete range of cable and festoon hardware and accessories including cable guiding and anchoring devices, damping devices, junction boxes, cable connectors, organisers and clamps, connection boxes, towing clamps, reels, cable, rope and webbing plugs and end clamps.